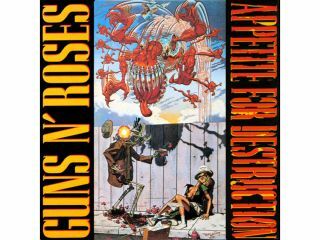 While waiting for Chinese Democracy to finally appear, and for Slash and Duff to pick a new singer for Velvet Revolver, Guns N' Roses fans will have something new (and old) to tide themselves over: a re-released vinyl pressing of Appetite For Destruction with its original artwork intact. Universal Music will issue the LP on Tuesday, September 9, 2008, and the cover features the same Robert Williams artwork that caused such a stir back in 1987. You can go to CD Universe to place your order today and be one of the first on your block to receive the record when it arrives. "Already a legend in its own meager lifetime, this startling debut shrouded itself in controversy, from its original Robert Williams artwork to Axl Rose's unblinking accounts of LA's underbelly. "This mawkish storytelling, combined with a brattish collective swagger and a surprisingly mature approach to their songs, guaranteed Guns N' Roses a speedy notoriety that was to serve their legend brilliantly. From the laconic Paradise City to the achingly beautiful Sweet Child O' Mine or the furious Welcome To The Jungle, the record brims with a brutal integrity. An album they could never surpass even if they had stayed together. "120 gram vinyl LP pressing of their genre-defining debut full-length album, originally released in 1987. The LP cover features the controversial original artwork. **Please note that this vinyl pressing features 'For Promotional Use Only' printed on the artwork." As a side note, MusicRadar has noticed that Amazon UK has yet again updated the release date for Chinese Democracy. According to the site, "This title will be released on September 29, 2008." All we can say to that is, "Hmmm."